Charles Latimer is a writer of detective novels. He is a very successful one at that but Latimer is in truth just a penname, his full name being Charles Latimer Lewison. It is under his real name that the writing he truly wanted to do was published, non-fiction, largely historic in nature. The history of the Hanseatic League was his most known work under his real name and it didn't sell very well. So to pay the bills, he wrote detective novels. Latimer had from the time he graduated from college been an academician, giving lectures on political economy and spending his free time researching heavy treatises on a variety of subjects. Having written three books, including a long history of a major Nazi figure, he had had enough of seriousness and started writing mysteries. Doing these revealed to him that he really did love cracking cases. The combining of both styles of writing, detective novels and historical research, is what creates the two adventures that are chronicled in the two books about Latimer. In both cases, Latimer hears something that interests him. Delving deeper into the background of each gets him further and further into danger but his love of mysteries and his passion for getting at the truth won't let him stop. The atmosphere captivated by both books make each a must read, especially the first which captures strongly the fear, anxiety, and in some cases the excitement that the events leading to war bring to a myriad of people. Latimer isn’t interested in international intrigue as he looks for what happened to Dimitrios but he cannot avoid dealing with them as he moves about Europe. Having been written about that time during that time makes the book a must-read. While vacationing in Istanbul, Charles Latimer hears the history of Dimitrios, a notorious criminals who may also have been secretly a spy. Investigating for fun, he begins to feel the subject was not dead and in trying to prove, Latimer becomes involved in the shadowy world of espionage and intrigue. Charles Latimer hears of the scheme from a neighbor in Majorca, one of the two culprits. The plan is ingenius. Large amounts of money are paid every day by Intelligence agencies to informers. What if the men handing the payoffs were also the informers, selling non-secret secrets? When he investigates, he goes missing. 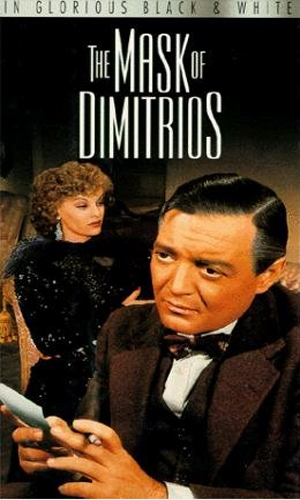 A film based on the first book was released in 1944 entitled The Mask of Dimitrios and starred the gifted actor Peter Lorre as Latimer, albeit with his name changed to be Cornelius Layden. Leyden (Latimer) becomes curious when a major crime boss washes up near Istanbul. I love a good mystery and this series has two of them. I love a good spy novel and both books in the series are that. 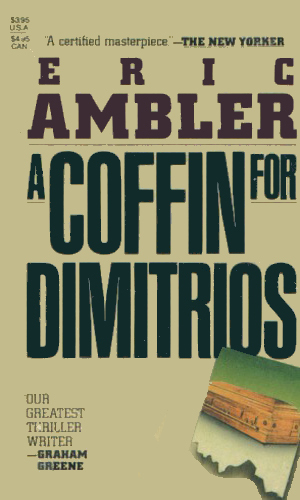 I love good writing and Mr. Ambler was not capable of anything but. 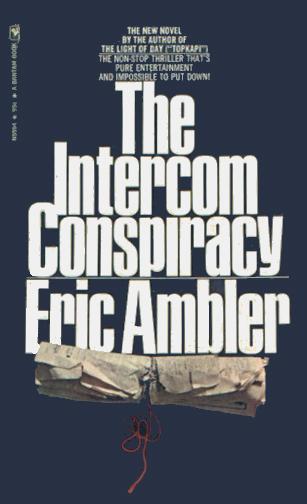 Nobody created the espionage drama as well as Mr. Ambler. His ability to put into words complex mixtures of emotions and attitudes and dreads and asperations is truly awe-inspiring and to do it while telling a fantastic story that holds you in that world so solidly, makes him probably the best there ever was. I love this series. I wish he had done more series.